The Mississaugas and the Six Nations were the predominant parties in land acquisition and ownership for what is now Wellington County. The Six Nations were comprised of the Five Nations Confederacy of the Mohawks, Oneidas, Onondagas, Cayugas, and Senecas, with the later addition of the Tuscaroras as the sixth member. Although the Six Nations had faithfully fought for the King, the Paris Treaty of 3 Sept 1783 failed to include the First Nation Loyalists. The negotiators had focused on the interests of the white Loyalists and the merchants and, consequently, the Six Nations had lost all. In the fall of 1783, General Haldimand empowered Sir John Johnson to buy land on the north side of Lake Ontario for the settlers. At that time, the Mississaugas (a branch of the Chippewas) occupied the area. The sale was completed the 9 Sept 1783 and the construction of Cataraqui (now Kingston) began during the winter of 1783/84. Concurrently, the Mohawks at Niagara decided that the Six Nations members would be better off if they stayed closer together and preferred to settle along the Ouse River (later called the Grand River). Haldimand recognized the military merits of locating the Six Nations allies near Niagara and initiated the process of purchasing the Grand River lands from the Mississaugas. Subsequent events during the War of 1812 confirmed the merits of Haldimand’s decision. The land was purchased from the Mississaugas on 22 May 1784. On the 25 October 1784 General Haldimand signed the land grant to the Six Nations. This granted the Six Nation Indians the right to take possession of and to settle on the banks of the Ouse River. They were allotted a tract of land six miles deep from each side of the Ouse River and extending from the mouth of the river at Lake Erie to the head of the river. If not for a flaw in the agreement, this would have included most of Wellington County. Augustus Jones, a Loyalist, was trained as a surveyor in New York City and in 1788 was appointed assistant to the deputy surveyor of the Niagara district, Philip Frey. His first assignment was the survey of Stamford Township. The following year he became acting Deputy Surveyor for Nassau District after Frey’s departure from Upper Canada. Jones was officially appointed Deputy Surveyor in 1791. He was responsible for most of the early surveying of the Niagara Peninsula, most Townships from Fort Erie to Niagara, the land along the Grand River, and the shore of Lake Ontario from Toronto to the Trent River. One of his earliest tasks (1784) was to survey a line from the Head of the Lake (Burlington) to the supposed headwaters of the Grand River. The survey began at Burlington Bay and ran in a straight-line, in a north-westerly direction, and at an angle of 45 degrees, until it crossed the river they believed to be the Thames (it was the Conestoga, at the present site of Arthur). This survey line is termed the Jones’ Base Line. It was from this Base line that the adjoining townships were surveyed; Puslinch, Guelph, Nichol, Peel and Arthur on the West side, Eramosa, Garafraxa and Luther on the East side. In 1791 he also surveyed the boundary of the Six Nation’s Reserve, extending along the Grand River from Lake Erie to the Puslinch-Guelph Township boundary (which formed the Western Boundary of Puslinch Township). At the time of Haldimand’s purchase of the land from the Mississaugas, little was known about the interior of region. Although Haldimand’s agreement with the Six Nations specified that all land to the head of the river was to be conveyed, this was not possible since the King had not purchased all of this land from the Mississaguas. Haldimand’s purchase, at the time, was thought to comprise the total area. It was not until Augustus Jones’ survey of the boundaries, completed 1791, that the error was identified. Consequently, all the land to the North-East of Jones’ top survey line was excluded from the Six Nations’ parcel. Another outcome of this survey was an agreement that the centre line of the Six Nations’ grant did not follow the river per se but was a six-mile area on either side of a straight line from a point near the river mouth to the Mohawk Village (now part of Brantford). Joseph Brant and others had expected that, once the Crown purchased the remaining territory from the Mississaugas, the remaining section to the head waters would be conveyed to the Six Nations. The Crown’s officials adhered to their interpretation of the law (i.e. the agreement could only include what could be legally transferred at the time, not what was intended to be transferred) and they did not transfer these lands as per Haldimand’s original intent. 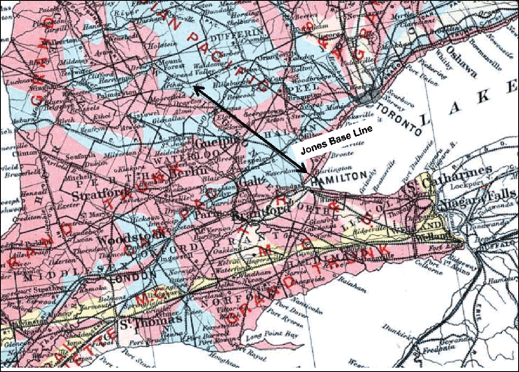 Thus, Jones’ Base Line became the northern limit of the Six Nations’ parcel. Brant and other members of the Six Nations had also requested that they be given a deed of ownership, not simply a grant of occupation. For years the Crown’s representatives had rejected this request based on a paternal concern that the Six Nations would make unwise decisions on the sale or transfer of the lands. On 14 Jan 1793 Lieutenant Governor Simcoe proposed a deed which restricted transfer to only among members of the Six Nations or between them and the King. This proposal was quickly rejected by the Six Nations. After many years of proposals, threats, and counter-proposals, a means to consummate a series of agreed to sales of land was devised. On 5 Feb 1798, six large blocks of land which were part of the Six Nations’ grant were surrendered to the King’s representative, Peter Russell, Administrator of Upper Canada. At the time of the conveyance, Joseph Brant prayed that the King would grant the six blocks to specific individuals (the ‘purchasers’). This was done. Part of block 3 (conveyed to William Wallace) later became Pilkington Township, and part of block 4 (conveyed to James Wilson) later became Nichol Township. The sale price was from two to six shillings per acre. Although it took five years to finalize the land transfer, it took even longer to sort out the legal tangles associated with the purchasers, many of whom had not made the agreed to annual payments. For instance, the ‘buyer’ of block 1 (Philip Stedman) died intestate (without a will) in a debtor’s prison in New York. By 1806, Capt. Robert Pilkington had purchased 15,000 acres of Block 3, and Thomas Clark, Queenston, had acquired Block 4, acquisitions that were of relevance to Wellington County since these led to the creation of Pilkington and Nichol Townships. Parts of the Crown’s purchases of 7 December 1792 (Between the Lakes Purchase) from the Mississaugas and 10 July 1827 (Huron Tract Purchase) from the Chippewas complete the story for the acquisition of land within what is now Wellington County. A section of the Huron Tract became the Townships of Peel, Maryborough, Minto and part of Arthur. Purchases of land from the First Nations was critical since it was only until parcels of land were owned by the King could the land be subdivided and be conveyed by the King to his subjects. Kelsay, I. T. 1984. Joseph Brant 1743-1807 Man of Two Worlds. Syracuse University Press. Syracuse, NY. Merriman, B. D. 2013. Genealogy in Ontario: Searching the Records. 30th Anniversary Edition. Ontario Genealogical Society. Toronto, ON.